SANTA CRUZ, CA--(Marketwire - January 26, 2011) - Plantronics, Inc. (NYSE: PLT) today announced the Calisto® 800 Series, the first speakerphones in its unified communications product portfolio that combine multi-device hands-free connectivity with intuitive visual call management. Optimized for use with Microsoft® Office Communicator and Lync™, these products were designed for private and home office workers who depend on multiple communication devices to collaborate effectively. 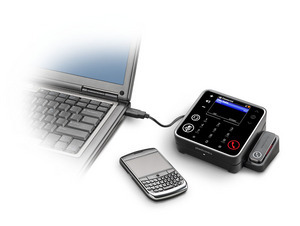 The Calisto 800 Series includes the Calisto 825, which manages calls between a PC and a mobile phone. The Calisto 825 also features a unique wireless microphone that provides unparalleled speakerphone audio quality and freedom of movement. The Calisto 825 simplifies PC and mobile phone call management through its intuitive visual display. Device setup is effortless and fast -- in less than five minutes users are up and running and able to switch between mobile and PC calls, dial, and mute across devices at the touch of a button. Professionals are afforded the choice to move around freely while on a conference call using the wireless lapel microphone or connect a Bluetooth® or corded headset to the speakerphone when privacy is desired. Additionally, the unit features unmatched audio quality and premium sound through echo and advanced noise cancellation technology. "Extensive research exploring the collaboration habits of today's dispersed workforce went into the development of the Calisto 800 series," said Bill Loewenthal, vice president of unified communications at Plantronics. "Today's office has moved beyond the cubicle environment. Whether work is conducted from a private or a home office, people want devices that simplify hands-free communication. The Calisto 800 Series simply unites modern professionals' most critical communication platforms." The Calisto 800 series of unified communications products provide premium sound and unparalleled audio quality thanks to full duplex wideband audio and advanced noise cancellation. In addition to the Calisto 825, the portfolio includes the Calisto 820 and the Calisto 830. The Calisto 800 series also offers a range of hands-free options including wireless connectivity with Bluetooth headsets or corded connectivity with 3.5mm headsets/headphones when privacy is desired. The Calisto 825 is a two-way speakerphone for the PC and mobile phone. It includes the PA50™ wireless lapel microphone, and charging base. It has an MSRP of $259.95. 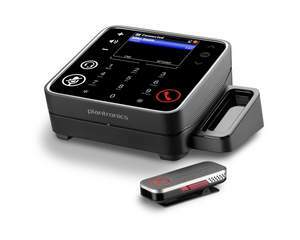 The Calisto 820 is a two-way speakerphone for the PC and mobile phone. It has an MSRP of $179.95. The Calisto 830 is a three-way speakerphone for PC, mobile phone and analog landlines. It includes a USB cable, analog/landline port, RJ11 cable and AC adapter and has an MSRP of $199.95. The PA50 is a wireless Bluetooth lapel microphone and can be purchased for either the Calisto 820 or 830 as an accessory. It comes with a charging base and has an MSRP of $79.95. The Calisto 800 Series is Optimized for Microsoft Office Communicator and Lync and is available through authorized Plantronics resellers and at www.plantronics.com/calisto. UC standard versions of the Calisto 825, 820 and 830 that will support a variety of leading softphones including those from Avaya®, Cisco®, IBM® and Skype® will be available in Spring of 2011. Please visit www.plantronics.com/calisto to learn more. This release contains forward-looking statements within the meaning of Section 27A of the Securities Act of 1933, as amended, and Section 21E of the Securities Exchange Act of 1934, as amended, including statements relating to Unified Communications ("UC") and our Calisto 800 series products, including timing of product availability. Forward-looking statements are based on management's current expectations and beliefs and involve risks and uncertainties that may cause actual results to differ materially from those contemplated by such statements. Among the factors that could cause actual results to differ materially from those contemplated are: (i) UC solutions may not be adopted with the breadth and speed in the marketplace that we currently anticipate; (ii) manufacturing or other production delays (iii) our plans are dependent upon adoption of our UC solution by major platform providers such as Microsoft, Cisco, Avaya, Alcatel, and IBM, and we have a limited ability to influence such providers with respect to the functionality of their platforms, their rate of deployment, and their willingness to integrate their platforms with our solutions. For more information concerning these and other possible risks, please refer to the Company's Annual Report on Form 10-K filed with the Securities and Exchange Commission on June 1, 2010, quarterly reports filed on Form 10-Q, particularly the sections entitled "Risk Factors," "Certain Forward-Looking Information" and "Management's Discussion and Analysis of Financial Condition and Results of Operations", and other filings with the Securities and Exchange Commission as well as recent press releases. Plantronics undertakes no obligation to update publicly any forward-looking statements to reflect new information, events or circumstances after the date they were made, or to reflect the occurrence of unanticipated events. Plantronics is a global leader in audio communications for businesses and consumers. We have pioneered new trends in audio technology for 50 years, creating innovative products that allow people to simply communicate. From unified communication solutions to Bluetooth headsets, we deliver uncompromising quality, an ideal experience, and extraordinary service. Plantronics is used by every company in the Fortune 100, as well as 911 dispatch, air traffic control and the New York Stock Exchange. 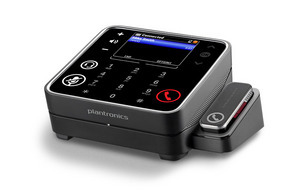 For more information, please visit www.plantronics.com or call (800) 544-4660. Calisto, PA50, Plantronics, Simply Smarter Communications are trademarks or registered trademarks of Plantronics, Inc. All other trademarks are the property of their respective owners.